OR teams of 2-4 students. 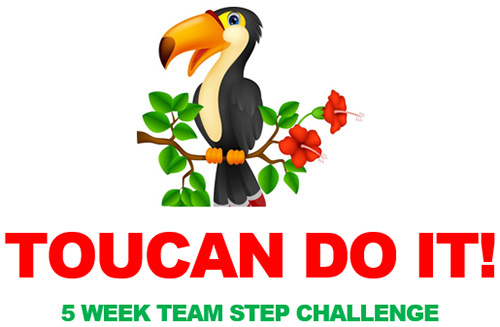 Tier 2 (top 5-10 teams) winners with the highest average steps. All activities that can be tracked on your tracker and translated into steps count. You must utilize a fitness tracker that can be synched to the Challenge Runner app. Weekly prizes given based on weekly Rain Forest themes! T-shirts given to each participant that completes 100 miles over the course of 5 weeks. FYI- 10,000 steps= 5 miles. Attend the social on Monday, March 25th at 12pm in the Campus Center South Lounge to purchase your activity tracker, find a teammate, ask questions regarding the challenge, or just help us kick-off this fantastic event! All steps recorded on the Challenge runner app on a weekly basis. You can download the Challenge runner app FREE on your smart phone and it will automatically synch with Fitbit, Jawbone, Misfit, Garmin products, Apple Health, Google Fit, and the smartphone Moves App. Albright aspires to a community which values “true equity and full participation”. Individuals of all abilities are encouraged to participate in our activities and programs. Please contact the Director of the Schumo Center to discuss inclusive options.